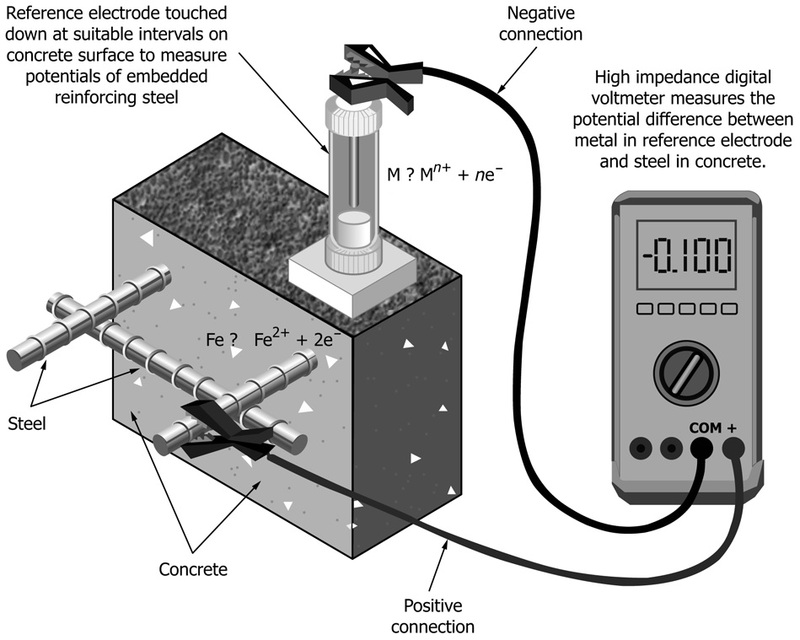 This test method covers the estimation of the electrical corrosion potential of uncoated reinforcing steel in field and laboratory concrete, for the purpose of determining the corrosion activity of the reinforcing steel. The reference electrode selected shall provide a stable and reproducible potential for the measurement of the corrosion potential of reinforcing steel embedded in concrete over the temperature range from 32 to 120°F (0 to 49°C). ASTM C876-15 “Standard Test Method for Corrosion Potentials of Uncoated Reinforcing Steel in Concrete”. While there is no pre-defined minimum spacing between measurements on the surface of the concrete member, it is of little value to take two measurements from virtually the same point. Conversely, measurements taken with very wide spacing may neither detect corrosion activity that is present nor result in the appropriate accumulation of data for evaluation. The spacing shall therefore be consistent with the member being investigated and the intended end use of the measurements. The type of connection used will depend on whether a temporary or permanent connection is required. Make a direct electrical connection to the reinforcing steel by means of a compression-type ground clamp, by brazing or welding a protruding rod, or by using a self tapping screw in a hole drilled in the bar. To ensure a low electrical resistance connection, scrape the bar or brush the wire before connecting to the reinforcing steel to ensure a bright metal to bright metal contact. In certain cases, this technique may require removal of some concrete to expose the reinforcing steel. Electrically connect the reinforcing steel to the positive terminal of the voltmeter. Special care should be exercised with prestressing steels to avoid serious injury and only mechanical connections should be made. Where welding is employed to make connections to conventional reinforcing steel, preheating will be necessary to avoid forming a brittle area in the rebar adjacent to the weld and such welding should be performed by certified welders. Attachment must be made directly to the reinforcing steel except in cases where it can be documented that an exposed steel member is directly attached to the reinforcing steel. Certain members, such as expansion dams, date plates, lift works, scuppers, drains, and parapet rails may not be attached directly to the reinforcing steel and, therefore, may yield invalid readings. Electrical continuity of steel components with the reinforcing steel can be established by measuring the resistance between widely separated steel components on the deck. Where duplicate test measurements are continued over a long period of time, identical connection points should be used each time for a given measurement. Care should be taken that the whole area of reinforcing mat being measured is electrically continuous by checking electrical continuity between diagonally opposite ends of the area surveyed. Electrically connect one end of the lead wire to the reference electrode and the other end of this same lead wire to the negative (ground) terminal of the voltmeter. Saturate sponges with the Electrical Contact solution and place on the concrete surface at locations described in 4.1. Leave the sponges in place for the period of time till the measured value of the corrosion potential does not change or fluctuate with time. 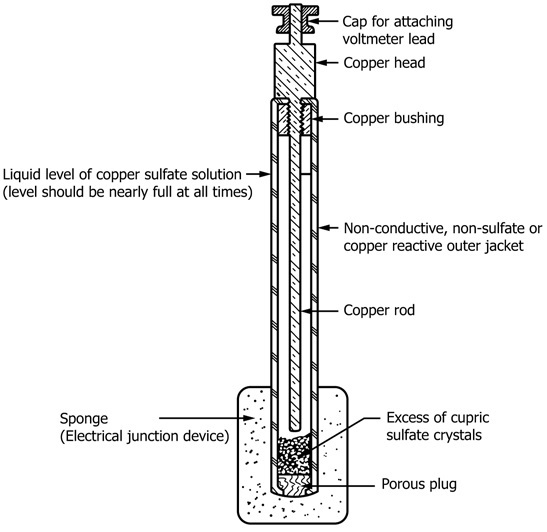 Do not remove the sponges from the concrete surface until after the reference electrode potential reading is made. In making the corrosion potential measurements, place the electrical junction device firmly on top of the pre-wetting sponges for the duration of the measurement. Record the electrical corrosion potentials to the nearest 0.01 V. Report all corrosion potential values in volts and correct for temperature if the reference electrode temperature is outside the range of 72 ± 10°F (22.2 ± 5.5°C) as per para 5.1.1.3 of ASTM C876-15. The corrosion categories are broken down from A to G. Category A being the higher possibility of corrosion.